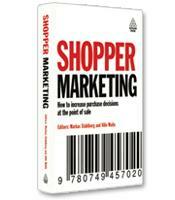 Edited by two respected practitioners, Shopper Marketing will show you how to make the most of shopper marketing. The book is comprised of articles written by 35 experts from around the world, and it provides practical advice regarding shopper needs and trends, retail environments, effective packages and much more. How shopper marketing has grown to be a significant global marketing phenomenon. How shopper behavior is changing. How to move beyond vague, commonplace marketing buzzwords and phrases by learning directly from the top shopper marketing practitioners. How to tap into a more in-depth understanding of new areas of shopper marketing.